Living a healthier lifestyle typically doesn’t involve big scary changes. In fact the easiest way to improve your overall well-being is usually to make small changes that eventually add up. Things like adding more exercise to your week. Making recipes like my Bruschetta Chicken Mason Jar Salads. Plus keep your adult beverages on the lighter side too! 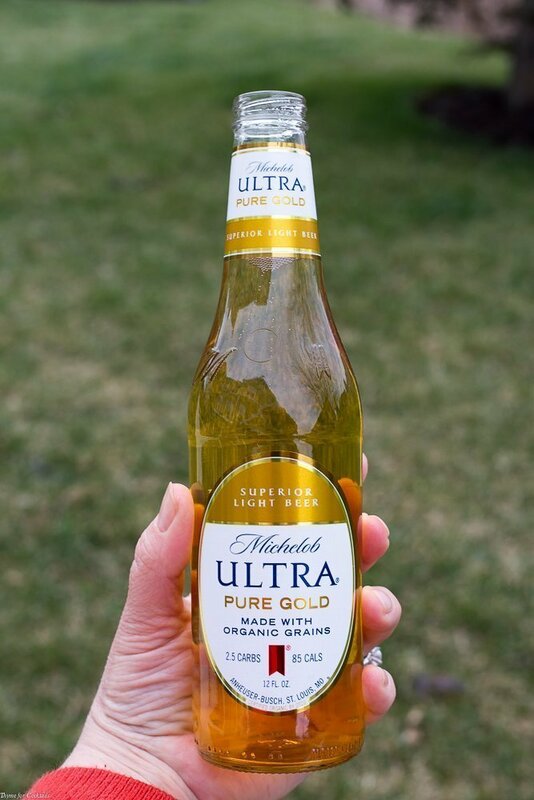 Michelob ULTRA Pure Gold is a light lager made with organic grains that give it a superior, golden taste. They have even partnered with the Sustainable Forestry Initiative for sustainable packaging! I love that it only has 2.5 grams carbs and 85 calories. Pure Gold is triple filtered and has no artificial colors or flavors. 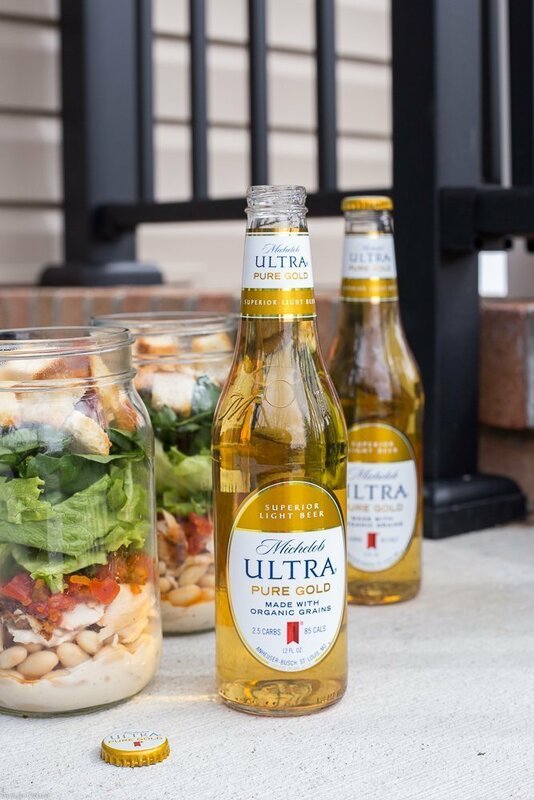 Making it a great pairing with these Bruschetta Chicken Mason Jar Salads. These travel-friendly salads are proof that healthier foods can also be convenient. Our weather has been super finicky lately. When the sun is out we make the most of it with a walk around the neighborhood. 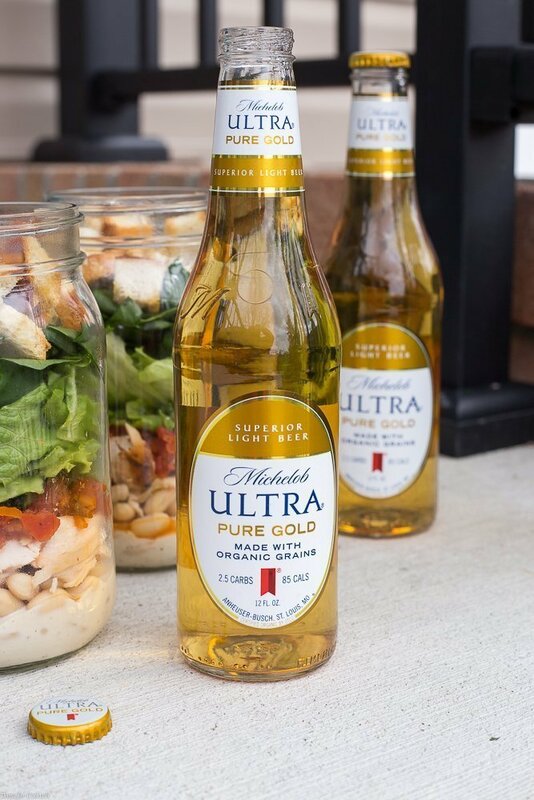 Then grab a Michelob ULTRA Pure Gold and enjoy a picnic on our stoop! Rotisserie chicken, low sodium canned cannellini beans, and plenty of fresh greens are delicious with bruschetta tomatoes and a creamy roasted garlic dressing. 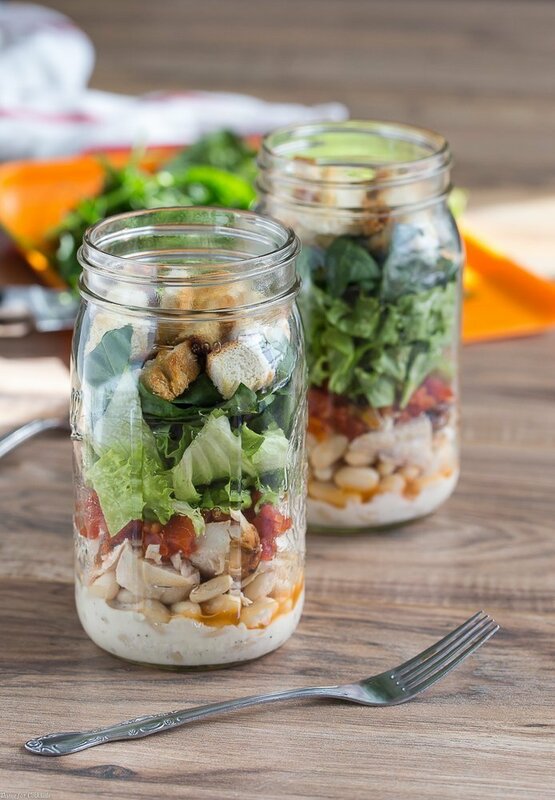 The key to mason jar salads is in the layering. You want to start with the dressing on the bottom. Then add in heavier items like beans and protein. Next layer heartier vegetables. Lastly you want top with light items such as your greens and toppings like croutons. 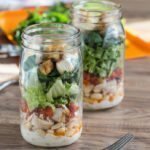 I hope you like these Bruschetta Chicken Mason Jar Salads as much as my crew does. If you love this travel-friendly recipe, you can find more like it by checking out my Salad section! For recipe inspiration delivered to your inbox, subscribe to my newsletter, follow my photography journey on Instagram, and for generally inappropriate humor follow like me on Facebook! Disclosure: Message intended for readers 21+ only. Please drink responsibly! Rotisserie chicken, low sodium canned cannellini beans, and plenty of fresh greens are delicious with bruschetta tomatoes and a creamy roasted garlic dressing. Evenly layer ingredients in order starting with the dressing in 2 extra large mason jars. Salads can be made ahead of time. Store closed in the refrigerator for up to 4 days. Shake jars while closed to coat with dressing before serving. Tip- Use your favorite low sugar store bought salad dressing or pick one one of these Homemade Vinaigrettes or Dressings. Canned bruschetta tomatoes are a convenient mix of diced tomatoes, garlic, onions, vinegar, and oil. Substitute a fresh bruschetta mix if desired.